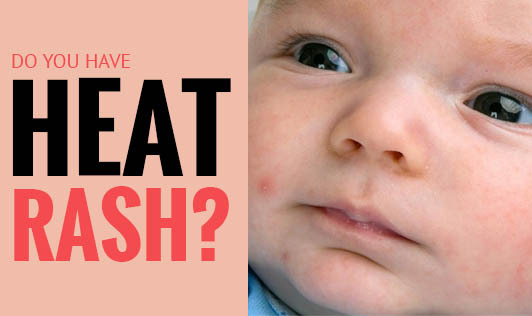 Do you have heat rash? A heat rash, also known as prickly heat or miliaria can affect both infants and adults during hot and humid weather. They usually develop when one's sweat ducts (pores) become blocked and perspiration is trapped under the skin. The rash appears as reddened skin with tiny blisters which is due to inflammation and often occurs in areas of tight clothing where air cannot circulate. Heat rashes usually heal on their own, but see your doctor if the rash seems to be getting worse and there are signs of infection such as pus draining from the lesions, fever, swollen lymph nodes in the neck, groin or in the armpit and increased pain, redness or warmth around the affected area.